All That Is Solid ...: Centrism on the Streets? A hundred thousand pounding pavements in London and you'd be forgiven for thinking it's a political earthquake. At least if you pay attention to the likes of Andrew Adonis and Alastair Campbell. Strangely, these estimates of significance get nowhere as near a wider circulation when trade unionists and community campaigner trudge through the capital in greater numbers. And, of course, for Campbell such measures of magnitude counted for nothing when two million people marched against the invasion of Iraq. Why should the latter be set aside and the former be taken seriously? There are nevertheless a couple of interesting features regarding yesterday's pro-EU march. Firstly, the politics. True to the annoying character of the EU's outriders on social media, what was most frequently shared in my timeline were political observations so naive and cringe it makes the Sally Army's Young Soldier read like Class War, and the now notorious chanting of 'Where's Jeremy Corbyn?'. That this was from a small section of the march comprised by organised contingents of Liberal Democrats should be enough to provide all the context you need. But this was, officially, a march for an additional referendum on the Brexit deal itself, though whether a No there would mean staying in the EU, renegotiating the deal, or crashing out the EU and getting the no-deal Brexit hard remain most fear is a point this "movement" isn't terribly clear on. For some, it offers a means of defying the referendum result ("it was only advisory!") and staying in the EU by the backdoor, if such a thing is possible. The truth is there were different people there for different reasons, some of whom were certainly Labour folks and those we need to win to the new left. For this reason, I don't think taking a sneering tone is particularly helpful. Rightly, the participation of elites, like his eminence, Chris Leslie deserve a good mocking. And treating LibDems with scorn is the correct approach any right-minded person should take, but beyond that there are serious grievances and concerns that have got tangled up with the pro-EU banner. Recap time. Labour was founded as a proletarian party, an organisation set up to represent everyone who had to work for a living, be it by hand or by brain and in return for a wage or a salary. Low paid or well paid, all were represented through the affiliation of socialist societies and trade unions, and is the structure that remains to this day (whether 'representation' is adequate is for another time). The immaterial recomposition of class relationships that is doggedly and persistently changing the character of work and social life is transforming politics, indeed, it is helping power Corbynism, but it is also contributing to the generalised anxiety and unease abroad in Western countries. Economic uncertainties are built into the daily lives of millions of people, including middle class people. Heavy workloads, constant restructures, the permeable barrier between home and work, the prospect of redundancy, the demands of servicing debt, making ends meet despite ostensibly good salaries, and providing for the future is the terrain from which many middle class people perceive political turmoil. Why does this matter to pro-EU politics, especially when the EU is an elite project and, therefore, fundamentally unaccountable? It comes down to the absence of political collectivity. With the decline of the labour movement and the associational life that used to nourish the Tory party, markers for stability, the institutions that worked as political anchors are fewer. How the NHS is popularly cherished is a symptom of this absence, as is renewed enthusiasm for the royal family and 'the nation', variously appealed to by sundry populists. For the section of the British middle class who are socially liberal and keenly feel the anxieties heaped upon them by everyday life, and granted the liberal internationalism that is its official ideology, the EU is spontaneously endowed with a 'progressive' character. From the late 1980s onwards it has been (consciously) sold to the liberal-minded British audiences as a vaguely social democratic institution, and one that is a bulwark against the worst excesses of the Tory party. In so doing, an identity was drawn between a not insignificant social milieu and this distant and sclerotic outfit. It was a buttress, a backstop for (small s) social security, of a feeling at home. The EU is a consolation, an ontological security blanket. Hence the anger at a Brexit vote delivered on the basis of lies and false promises, and a genuine fear the costs of leaving the EU means further hits to everything they care about, including themselves. The uncertainty is ramped up and they could be among its casualties. Hence the protests. It is borne of a frustration with a government taking the most cavalier and reckless approach to talks with the EU, and a Labour Party that - rightly - refuses to set aside the referendum result. The remain ship has sailed and politics is now largely a matter of adopting the least worst, least disruptive, and least damaging exit from the EU. Winning over people who were on or supportive of the march and don't have an anti-Corbyn axe to grind means we don't write off their concerns, because their worries are our worries, their concerns are class concerns shared by many millions of others. If we hope to win the next election, if we hope to transform economy and society and reset the balance of power permanently, we cannot afford to abandon this constituency to the LibDems and the Greens, especially as polarisation is a fact of political life and the next election is going to be a matter of who can turn out the most. I agree on the whole that it is a done decision, but a monumental decision was made by the slightest majority based on lies - how many votes were swung on promises about the NHS or immigration? Certainly more than 2 per cent. There should be an inquiry, and arrests - for treason. It is such a catastrophic decision completely outside the tradition of parliamentary democracy that the honourable thing would be for Labour to stand on - say - an EEA ticket at the next election. Will they? No, because JC and his swivel-eyed Maoist fringe are as anti-EU as the maddest Rees-Moggs. This particular trope about Jez is even more tedious than most. He is a Euro-SCEPTIC, in the genuine sense of that word. Along with the vast majority of Labour MPs, he fully supports a soft Brexit. 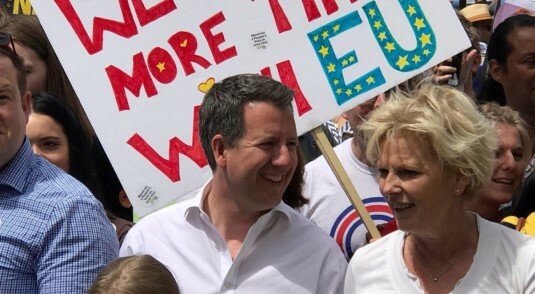 The march demonstrates that all the crap from the Brextremists about it being supporters of Brexit that would rise up if anything but the hardest Brexit is achieved has no substance. Their counter-demonstration was pathetically small. It is a disgrace that people like Cable, Leslie et al were able to put themselves at the vanguard of opposing reactionary nationalism. Even Campbell was able to attack Labour rightwingers last week on The Daily Politics for turning themselves into imitations of Kippers, with their disgusting pandering to anti-immigrant sentiment. Labour seems intent on both shooting itself in the foot, by enabling forces like the Liberals, Greens, SNP et al, who should have been consigned to the dustbin of history, to eclipse it from its Left, by an inane support for democratic primitivism, and refusal to take a principled position of leadership in opposing Brexit. The job of Labour leaders is to lead, not to tail some supposed popular opinion that was expressed in a narrow vote two years ago, and whose consequence is highly detrimental to workers interests. If they can't do that, we should get new leaders who will take a principled internationalist stance, and who will lead. Sorry to see you taking this pro-Brexit line, Phil - especially basing it upon an argument about democracy that seems to suggest the democratic process re the EU stopped on the day of the referendum. The more the fundamentally reactionary nature of Brexit (even when dressed up in the fantastical guise of so-called "Lexit") becomes apparent, the more essential it becomes for the left to take a clear stance of reversing it. At the very least, the Labour membership must be given a debate and vote at Conference. Respecting the vote has always been my position, Jim. Brexit is awful. Setting aside a democratic decision is even worse. Theresa May's government isn't actually doing any negotiating at the moment, and has done precious little negotiating for the last 12 months: it is simply demanding that the EU allow the UK carry on trading with the Single Market and participating in various agencies and programmes while not following the rules that are an integral part of trade and cooperation (which the UK under Thatcher and Major helped to create). Theresa May's government has no leverage to achieve this: the assumption that businesses in Europe would demand that the EU give the UK a special deal, which was the original justification for claiming that the UK could have its cake and eat it too, evaporated almost two years ago. The supposed leverage is the threat to walk away with no deal, which is no leverage at all. The rule in negotiations isn't that you should be prepared to walk away with no deal: it is that you don't put yourself in a position where walking away with no deal causes damage to yourself. Theresa May's government has put the UK in a position where walking away with no deal would cause a vast amount of damage to the UK, and it has no other leverage. It would be good to hear the Labour Party making more noise about why the government's strategy is useless and criticising the calls to "get behind May in the negotiations". Otherwise the risk is that Labour becomes associated with the illogical nonsense of the Brexiteers. It avoids being seen to be disrespecting the vote or having a rose-tinted view of the EU, though it may make the public wake up to how badly May has performed and eventually change the electoral arithmetic. Anybody who thinks we can just wave the referendum result away is a delusional idiot, quite frankly. Ever heard of the "stab in the back" myth, people? So, why not then support the Tories manifesto policies that won the most support at the last elections; why not support the Poll Tax that Thatcher stood on and won election majorities for; why not become an ardent proponent of hanging if we were to have a referendum on the death penalty, which no one doubts would result in a large majority for its reintroduction, and so on. This is just chronic democratic primitivism, and a debilitating failure to lead. It looks like out and out populism rather than anything approaching principled politics. Worse than that as the weekend showed, there is no huge level of antipathy to if the vote was overturned, but there is hueg opposition to what is a reactionary and highly damaging decision. Given that most of that antipathy comes from the young people, who have been flocking to Labour, and given that around 75% of Labour voters, even in Leave voting constituencies, supported Remain, it seems not just unprincipled, and weak it looks pathetically ill advised. The impression must be, therefore, that the failure to lead is really just a reflection of the old Stalinist/national socialist sentiment of opposition to the EU, of Little Englanderism being the real reason for the lack of any principled stand. It had disastrous consequences in the 1980's, and is likely to have disastrous consequences now. Now is precisely the time when we need socialists and progressive social democrats to lead and to take a principled internationalist position! Not at all Boffy. You're not comparing like with like. Opposing Tory policy is one thing, demanding *the state* sets aside a democratic decision is something else entirely. A referendum is NOT the same thing as a general election, any "analysis" that conflates the two is flawed from the start. I don't thin that I have anywhere called for "the state" to set aside a democratic decision! I have only called for Labour to oppose the decision, just as I would hope that Labour would oppose a Tory government, and its policies however large a majority it won at an election, just as I would hope that Labour would oppose capital punishment whether or not it was the law of the land, including if it had become the law of the land following a large referendum voting in support of its introduction; just as I would hope that if tomorrow the Tories called a referendum over whether to criminalise homosequality, deprive women of the vote, send non-whites to Gas Chambers or any other such reactionary policy Labour and any decent socialist would not simply oppose such measures up to and including the referendum, but would continue to oppose such policies after the referendum too whatever the result! This really should not need to be even said, or discussed, and to be honest some of the arguments against Labour taking a principled stand are so weak and disingenuous that they really do have the appearance of people who refused to accept the result of the 1975 Referendum - which was 2:1 to join the EEC, and subsequently EU - and who have backed things like No2EU, at elections, but who will not now come out openly in their true colours, for fear of losing the support of all of the young Corbynistas that do not support that position, who are cravenly using these arguments purely as cover. If Brexit leads to a hard border across Ireland, what will the Labour Party's position be? A hard border across Ireland means reneging on an international treaty. Is the Labour Party going to say that this is what people voted for? If Brexit leads to a severe economic downturn (with a whole load of further knock-on effects), what will the Labour Party's position be?Is the Labour Party going to say that this is what people voted for? I think that the risk of these happening is non-negligible, because Theresa May's government has no negotiation strategy to avoid these outcomes except to hope that the EU provides a face-saving fudge. How will the Labour Party position itself to avoid being complicit in these outcomes? If these outcomes are avoided, it will be because of a fudged compromise, and most of the compromises will be by the UK (because the EU is not going to spend a lot of time rewriting the rules of the Single Market to please the UK. It is likely that many Brexiteers will start complaining that it isn't a real Brexit and that they have been betrayed and stabbed in the back because the EU hasn't given the UK what it wants. Is the Labour Party going to go along with this? The Labour Party needs to position itself to create a clear distinction between "what it supports/what people voted for" and some possible disastrous outcomes, and it needs to avoid trying to re-position itself at the last minute. In my view, the distinction is not yet clear enough. A good start would be to make more noise about Labour's attempt to get the Tory "rebels" to actually rebel and support a "meaningful vote" and why Labour did this, but that would just be a start. Problem for us is that we've been dishonest about Brexit too. Hence the nonsense of a jobs first brexit and this latest shilly shallying around the CU and "full access" to the SM. Its as if Labour are going to deliver the Unicorns that the Tories simply cannot. Its been dispiriting to see shadow ministers, who must know what the EU will or wont allow, trot out complete gibberish when interviewed. If we cannot set out the real choices and consequences of Brexit in a calm, considered and rational manner, just what the hell are we for? We have a responsibility to provide principled, forthright, coherent opposition to the major issue of the day, and one that will be around for years to come, irrespective of how this eventually plays out. * See the absence of a shadow cabinet response to the Airbus/BMW stories over the last week. We should have been all over this but what have we got to say? a Labour Party that - rightly - refuses to set aside the referendum result. So wrong. The referendum was made meaningless by the meaningless discourse. Is this discussion now at an end? bour could be making all kinds of arguments that you would never hear about given the way the media mis-reports them, but they don't seem to be putting up a clear idea of their own about how to go about Brexit. Post Brexit the UK could simply have open borders to trade, including in Ireland, to meet it treaty obligations.